Chickpeas aren't just for making hummus—they have recently found their place in main chicken dishes, hearty vegetarian grain bowls, and even as a healthy snack food. This recipe for roasted chickpeas with garlic and paprika can be eaten out of hand as well as added to mezze platters, pasta dishes, and vegetable salads. Oven-roasting canned chickpeas (a.k.a. garbanzo beans) enhances their texture and infuses them with flavor. In this simple recipe, olive oil-glossed chickpeas roast alongside lots of garlic and a sprinkling of paprika. You can use smoked paprika instead of regular paprika to add another dimension of flavor to this simple recipe. Be sure to drain the chickpeas very well, as any residual liquid will cause the chickpeas to steam instead of crisp up. Place the chickpeas in a baking dish just large enough to hold them in a single layer. Break up the garlic cloves over the chickpeas and sprinkle evenly with the paprika. Drizzle the chickpeas with the olive oil. Cover the dish with foil, place in the preheated oven, and roast for 20 minutes. Remove the foil, stir, then continue baking uncovered for 10 to 15 minutes, or until the garlic is soft and the chickpeas begin to crisp on the outside but remain tender on the inside. Delicious enough to eat as is for a snack, these roasted spiced chickpeas are also a wonderful addition to some of our favorite recipes and dishes. A farro salad with cauliflower features roasted chickpeas, and butternut squash gains flavor and texture from roasted chickpeas and tahini sauce. Instead of crackers or croutons, crispy chickpeas add a nice crunch to cumin cauliflower soup, and roasted chickpeas play a major role in a vegan vegetable taco. Impress your guests with a cute dumpling squash stuffed with roasted chickpeas, spinach, and feta cheese, all drizzled with a lemon tahini dressing. 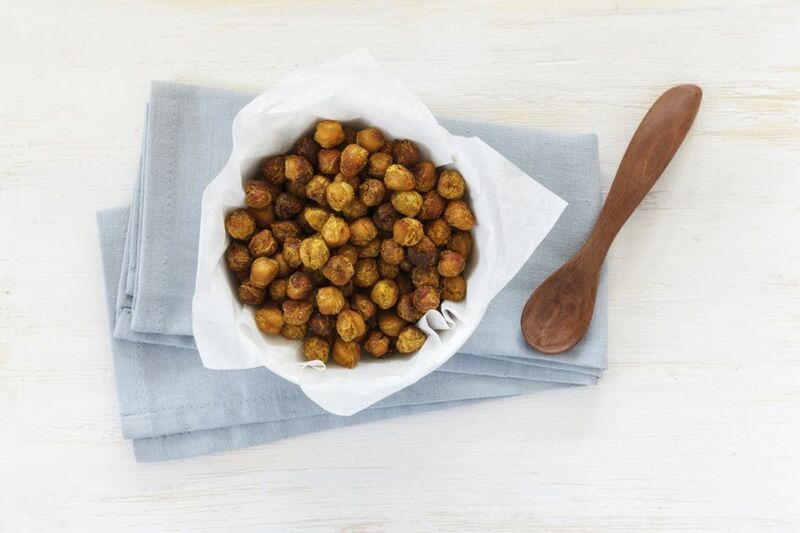 And the next time you serve cocktails to guests, put out a bowl of these crispy, roasted chickpeas; the paprika and garlic go perfectly with a nice, cold beer or other iced cocktail. If you can't seem to get enough of this recipe, you may want to try a few other versions of seasoned roasted chickpeas. If you're looking for something without spice, try roasted chickpeas with Parmesan and rosemary, or tamari roasted chickpeas with maple syrup and ginger. Cumin and turmeric add flavor to roasted chickpeas, while wasabi kicks up the heat.